Gigi Hadid's long-standing partnership with Stuart Weitzman just blessed us with another pair of shoes, following last year's covetable Gigi Boots. This time around, Hadid, who is the face of the brand and donates a portion of the shoes' proceeds to Pencils of Promise, designed beautiful embroidered pointed-toe mule loafers. 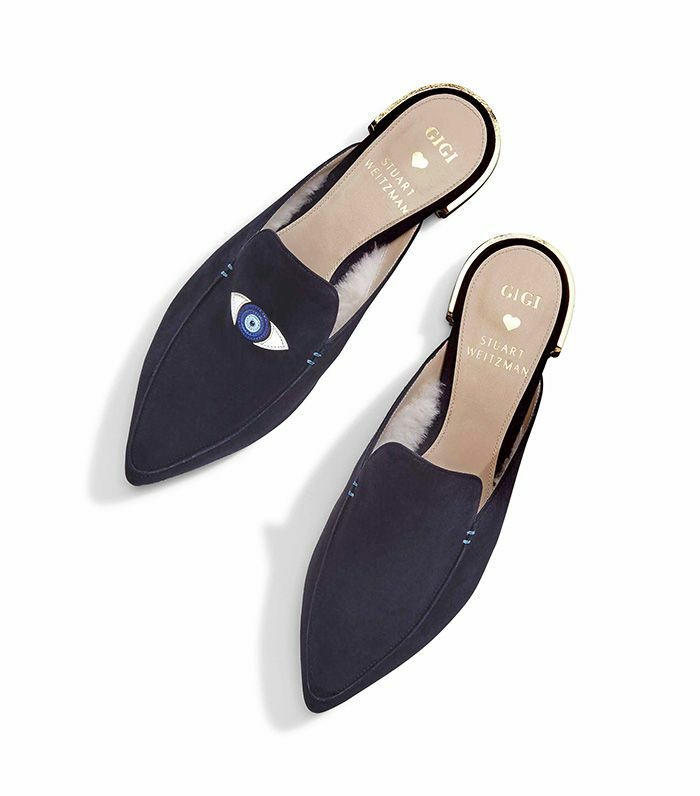 The Eyelove and Eyelovemore Mules are constructed of suede (in three different shades) and feature an evil eye motif on the right foot of each. A metallic heel ups the pretty factor even more while shearling lining ups the comfort factor. The description of the shoes includes a quote from Hadid about her choice of an evil eye motif. She explains, "The evil eye is a powerful symbol meant to protect those who wear it from negative energies. It’s emotionally comforting and beautiful and captivating to look at." The mules are available starting today and given that Hadid is set to make an appearance at Stuart Weitzman in SoHo, you can expect to start seeing her wear them around NYC as of today. Keep scrolling to watch a Hadid-starring short film in celebration of the pretty flats and shop them for yourself! Next up, check out the Gigi Hadid style moments we're still talking about.